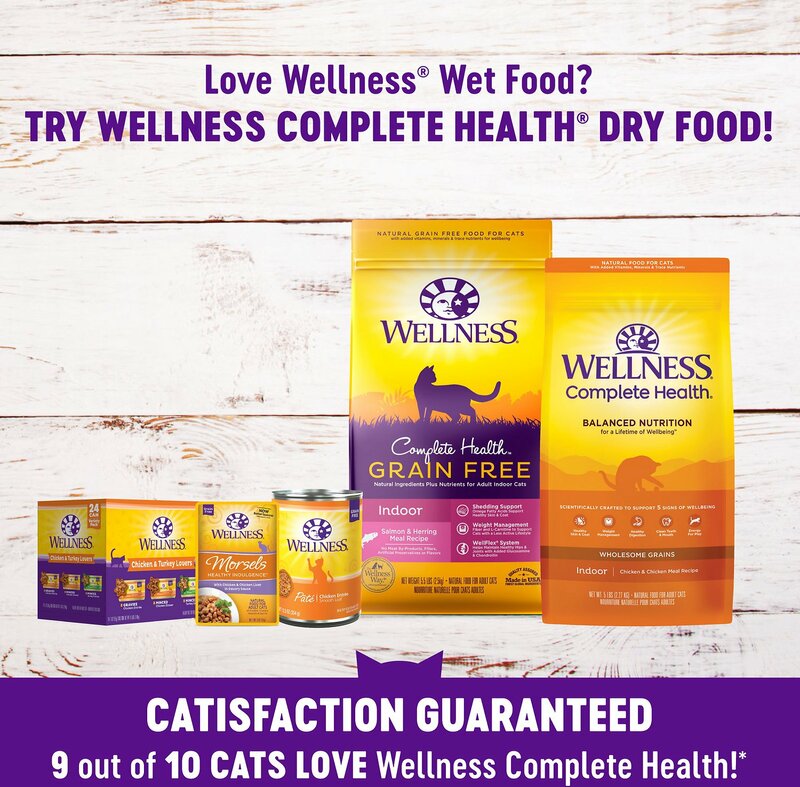 Treat your picky cat to a meal even they can love with Wellness Healthy Indulgence—a menu of delectable tastes and textures to satisfy the most demanding palate. With taste in mind, but health at heart, they slow-cook chicken, turkey, and skipjack tuna into tender shreds all served in a delicious sauce. Without artificial colors or flavors, this is the Wellness way to enjoy life’s everyday indulgences. 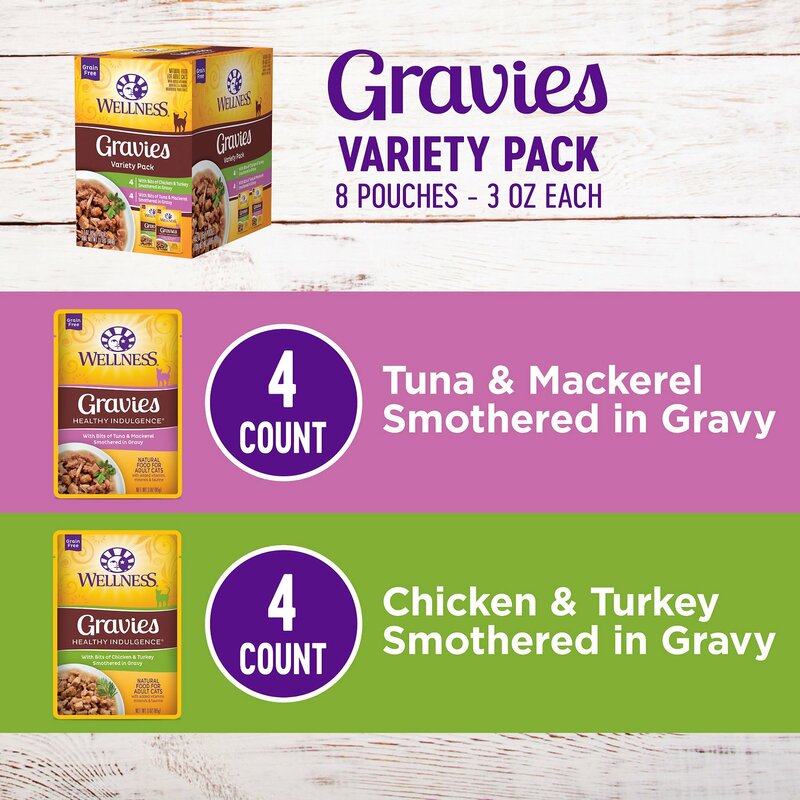 Their favorite Shreds Variety Pack includes 8 pouches featuring two delicious recipes: Chicken & Turkey in Light Sauce and Skipjack Tuna & Shrimp in Light Sauce. 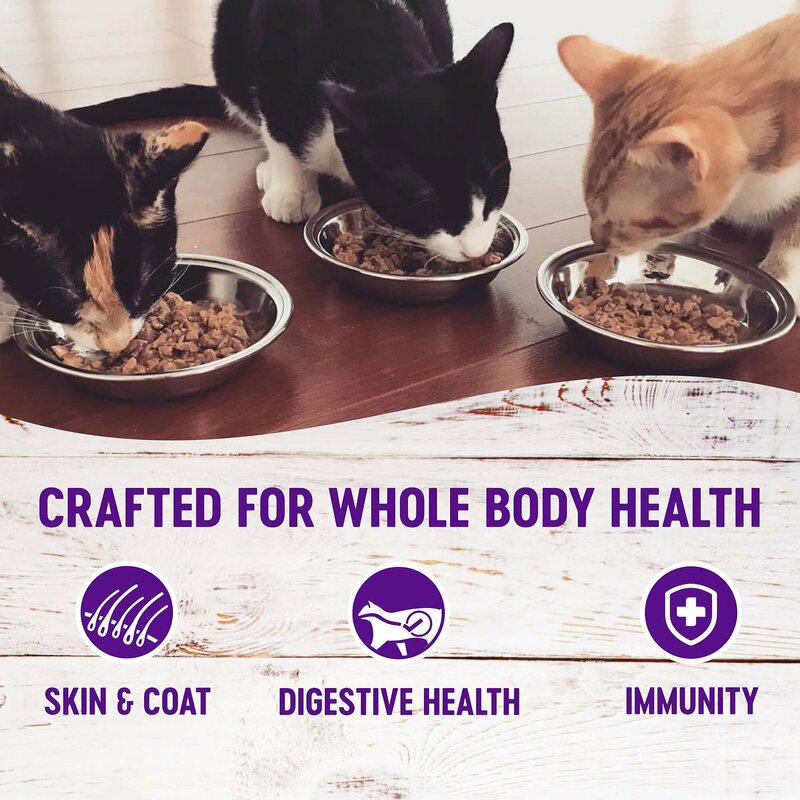 Grain-free, complete meals come with balanced, everyday nutrition for your cat. 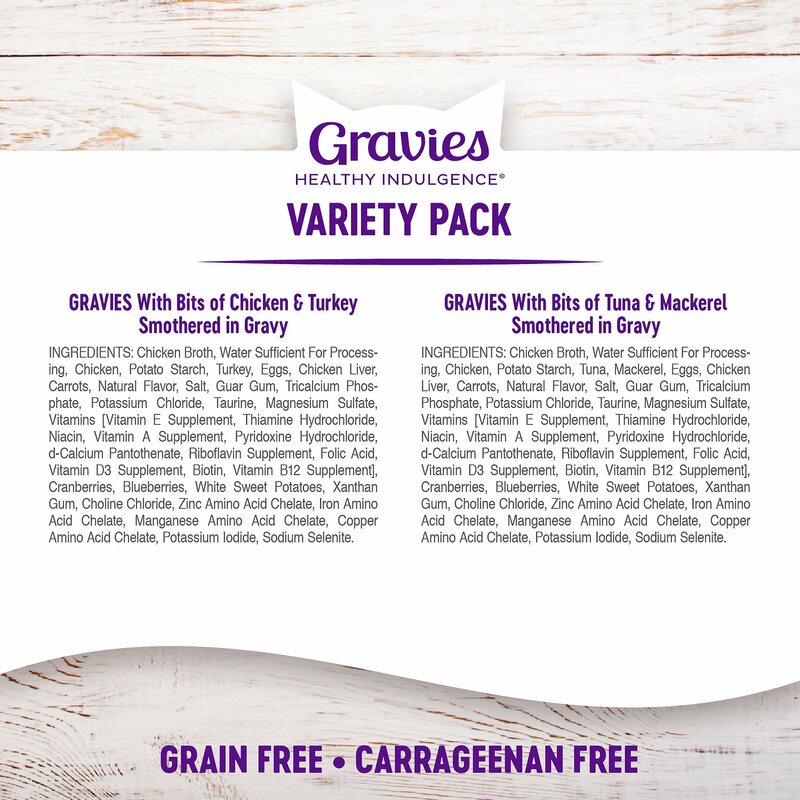 All natural, slow-cooked meals are made with real morsels of chicken, turkey, tuna and mackerel in delicious gravies. Contains only premium, all-natural ingredients with no wheat or wheat gluten, corn, soy, artificial colors or flavors. 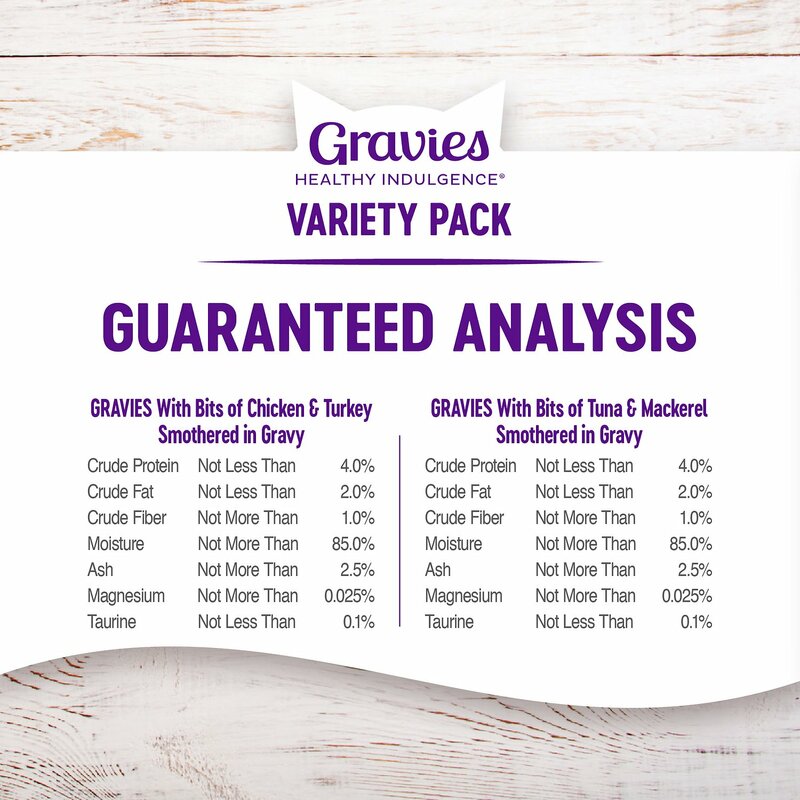 Chicken & Turkey: Chicken Broth, Water Sufficient For Processing, Chicken, Potato Starch, Turkey, Eggs, Chicken Liver, Carrots, Natural Flavor, Salt, Guar Gum, Tricalcium Phosphate, Potassium Chloride, Taurine, Magnesium Sulfate, Vitamins [Vitamin E Supplement, Thiamine Hydrochloride, Niacin, Vitamin A Supplement, Pyridoxine Hydrochloride, D-Calcium Pantothenate, Riboflavin Supplement, Folic Acid, Vitamin D3 Supplement, Biotin, Vitamin B12 Supplement], Cranberries, Blueberries, White Sweet Potatoes, Xanthan Gum, Choline Chloride, Zinc Amino Acid Chelate, Iron Amino Acid Chelate, Manganese Amino Acid Chelate, Copper Amino Acid Chelate, Potassium Iodide, Sodium Selenite. Tuna & Mackerel: Chicken Broth, Water Sufficient For Processing, Chicken, Potato Starch, Tuna, Mackerel, Eggs, Chicken Liver, Carrots, Natural Flavor, Salt, Guar Gum, Tricalcium Phosphate, Potassium Chloride, Taurine, Magnesium Sulfate, Vitamins [Vitamin E Supplement, Thiamine Hydrochloride, Niacin, Vitamin A Supplement, Pyridoxine Hydrochloride, D-Calcium Pantothenate, Riboflavin Supplement, Folic Acid, Vitamin D3 Supplement, Biotin, Vitamin B12 Supplement], Cranberries, Blueberries, White Sweet Potatoes, Xanthan Gum, Choline Chloride, Zinc Amino Acid Chelate, Iron Amino Acid Chelate, Manganese Amino Acid Chelate, Copper Amino Acid Chelate, Potassium Iodide, Sodium Selenite. 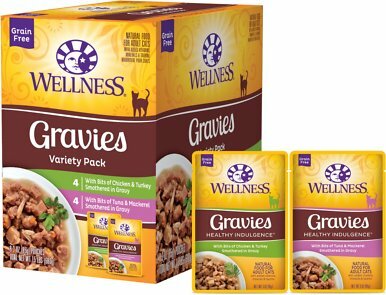 Fed alone: for cats weighing 4-10 lbs feed 2.5 - 4.5 pouches per day. 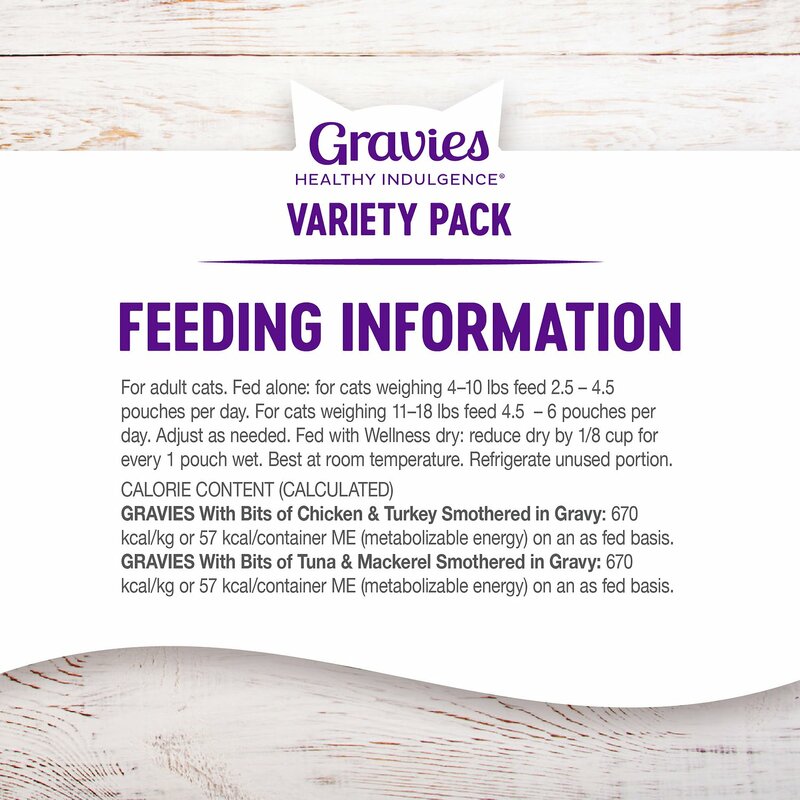 For cats weighing 11-18 lbs, feed 4.5 - 6 pouches per day. Adjust as needed. 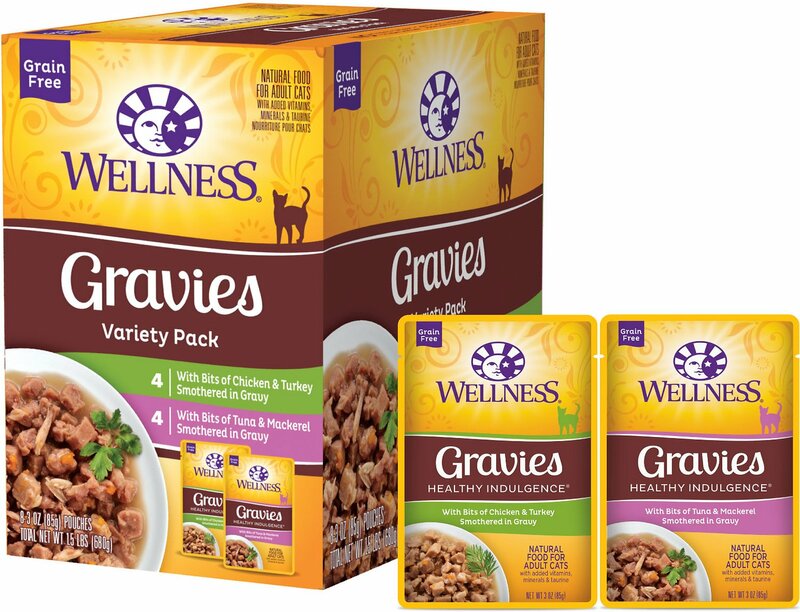 Fed with Wellness dry: reduce dry by 1/8 cup for every 1 pouch wet. Best at room temperature. Refrigerate unused. My one cat who I thought would absolutely love this food, just pushed it around on his dish and made a mess more than anything. So far, he’s only tried the Chicken & Turkey variety, I haven’t tried the Tuna & Mackerel, mostly because he just didn’t seem to be a fan of it. 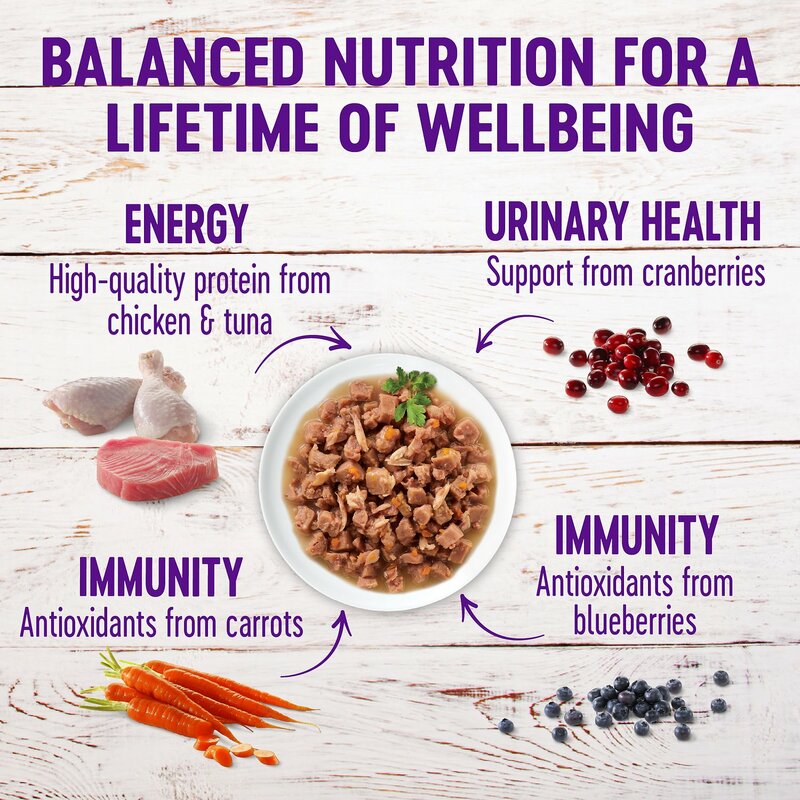 This food is grain free, all natural, and slow-cooked, made with real mackerel, chicken, tuna, and turkey. There’s no corn, soy, gluten, artificial flavors or colors. You would think that he would be all over this food, but, nope. He just isn’t into it. So, while we won’t purchase this food, we probably would recommend it because not all cats like the same thing. 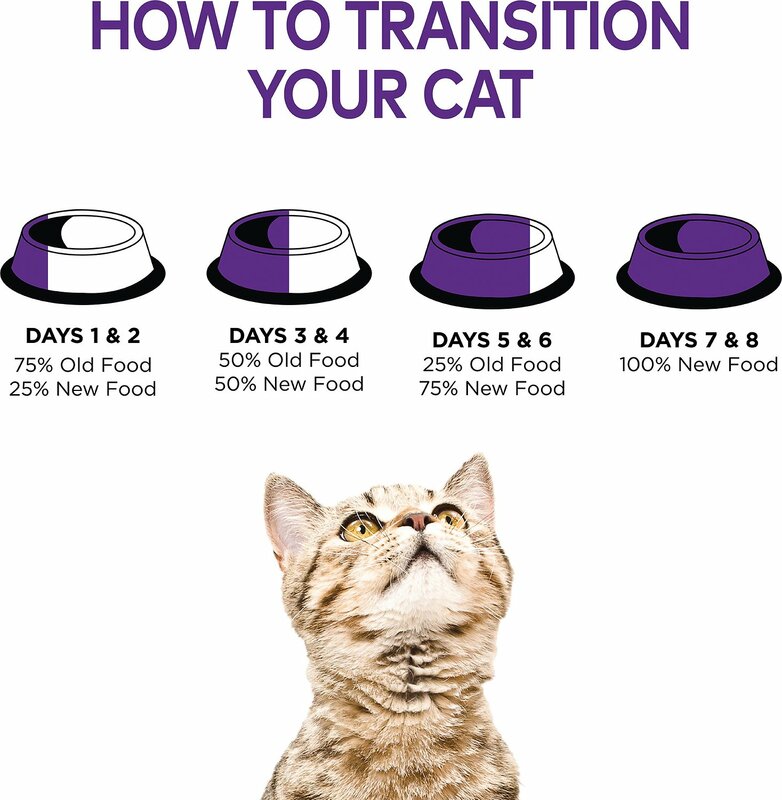 First off, our cats love this food!!! The problem is, when I first purchasd this product it came in a case of 32. One box with 4 smaller boxes containing 8 pouches each. We'd ordered it twice and recieved 32 pouches. Well, we just got our Auto ship and only recieved 8 total pouches for the price of 32. Then customer service couldn't replace the wrong item because it now doesn't exist in their system. What happened here? 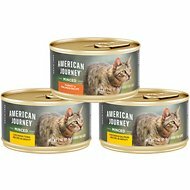 Absolutely love this food for my cat!! It is the ONLY cat food she will eat. I will buy this time and time again. Only thing is the cans are a better price point for me so I will probably continue to buy them instead. Eating less and loving it! My cat isn't a picky eater in the slightest and it shows. As I've tried getting her to lose some weight, she's visibly and audibly upset about the reduction in portion sizes. However, she seems to get full quicker with this food and as a bonus she seems to prefer it to most others. She's lost 1/2 lb without even noticing. We're just 2 happy campers now, thanks for a great product. All of the cats seem to like this product. It is nice to get two flavor per packet and two different kinds of packets per package. 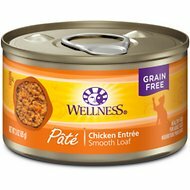 Our cat enjoys this pouched food and screams for it before gobbling it in record time. It's good to see him enjoy healthy food so thoroughly. My cat absolutely loves these packs!! Perfectly portioned for her too! I just cut it open and pour it straight into her dish. No problem, no mess.